It is hard to believe that nearly four months has passed since the Australian Open concluded in Melbourne, but here we are with another major upon us and a potentially fascinating fortnight ahead on the red clay of Roland Garros. All of the leading players have done their roadwork in preparation for the French Open, knowing that what happens in Paris is far more important than anything that preceded it, hoping that they can peak for the sport's preeminent tournament on the dirt, realizing that this is an opportunity that comes around only once a year. The competitors are acutely aware of the way conditions can change from minute to minute across the 15 days of play. They must be ready for anything: damp and debilitating days; scorching afternoons under bright blue skies and a broiling sun; steady rain and drizzle that makes the balls impossibly heavy and causes shoulders to ache; and widely varying temperatures even within the course of one match. In many ways, Paris is the most demanding major of them all because it asks so much of the participants from both a physical and psychological standpoint. But using history as a reliable guide—as well as analyzing current form—the view here is that, barring an injury or a career altering performance from an inspired opponent, a charismatic left-hander from Spain is going to secure his tenth title and collect a 15th Grand Slam championship in the process. Rafael Nadal has not approached a French Open with this much inner conviction since he won his 8th title four years ago. To be sure, he garnered his ninth crown a year later, but he had not been entirely himself en route to Paris that season. 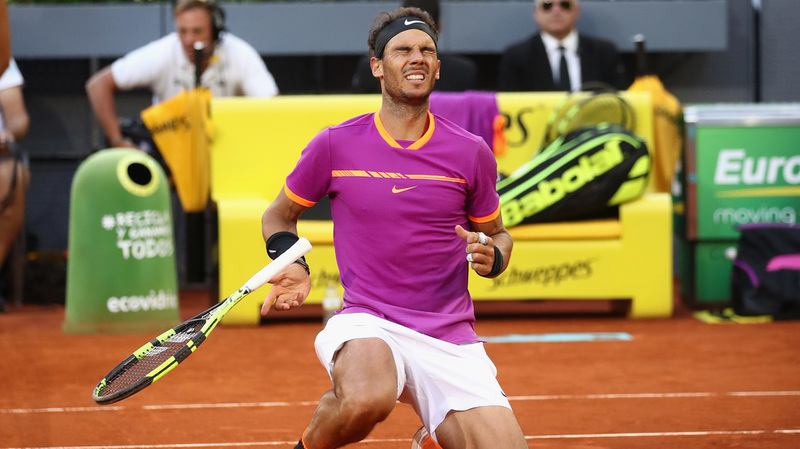 This year, Nadal has paved the way for a landmark triumph after celebrating an excellent clay court circuit. He was victorious in Monte Carlo, Barcelona and Madrid in succession, claiming those three titles in a row at the cost of only two sets. Although he was ousted in the quarterfinals of Rome by a top of the line Dominic Thiem, the loss does not diminish Nadal's status as the clear favorite in Paris. Nadal had already accounted for Thiem in the finals of Barcelona and Madrid. He had won 17 matches in a row before the Austrian took him out of Rome. Losing one match on the clay was arguably a good thing for the Spaniard, who lacked his customary unbridled intensity against Thiem. Looking at his Roland Garros draw, Nadal's path seems uncluttered. The No. 4 seed will have a reasonable test in the opening round against the Frenchman Benoit Paire, a player who made it to No. 18 in the world early in 2016. Currently stationed at No. 45, Paire will have some headwinds propelling him when he plays Nadal, but he will be outclassed. Nadal may meet another Frenchman in the third round, but as perspicacious as No. 31 seed Gilles Simon may be, he can only bother the Spaniard for so long. If all goes according to plan, Nadal could have a round of 16 clash with Jack Sock. Twice this year and once before at the French Open, Nadal has outperformed Sock and there is no reason to believe it will be any different this time around. In the quarterfinals, Nadal figures to play either No. 5 seed Milos Raonic, No. 11 Grigor Dimitrov or No. 20 Pablo Carreno Busta but his superiority will be clear in any of those potential match-ups. How does the semifinal scenario shape up? That question is not easy to answer. On paper, Nadal is expected to take on defending champion and No. 2 seed Novak Djokovic, but will the Serbian get to that stage of the tournament? The 30-year-old has displayed immense consistency over the years at the world's premier clay court tournament. In his last ten appearances, he has missed the semifinal cut only twice. In addition to his breakthrough victory last year—when he became the first man since Rod Laver in 1969 to sweep four majors in a row—Djokovic has been in three other finals, twice falling against Nadal, bowing against Stan Wawrinka once. He opens in Paris against Spain's hard charging yet vulnerable Marcel Granollers. He could be tested by Portugal's industrious Joao Sousa in the second round. In the third round, Djokovic might find himself up against either the left-handed attacking player Mischa Zverev or the energetic Diego Schwartzman. I believe Djokovic will have the goods to carry him past any of these players. That would take him into the round of 16 against either the Frenchman Lucas Pouille (the No. 16 seed) or perhaps No. 19 Albert Ramos-Vilonas. Djokovic could be pushed considerably by either man; Pouille upended Nadal at the 2016 U.S. Open and Ramos-Vilonas defeated Andy Murray on clay this season. But I envision the Serbian advancing to the quarterfinals. He might well meet the No. 6 seed Thiem in the last eight. Thiem had a dandy of a clay court season with his two final round appearances versus Nadal and a semifinal showing in Rome. But he was obliterated by Djokovic 6-1, 6-0 on the Italian clay. Moreover, he was crushed by Djokovic in the semifinals of the French Open last year. He has never beaten the Serbian and Thiem candidly conceded after his loss to Djokovic in Rome that he doesn't like the matchup in the least. If they do clash again on the clay in Paris, I like Djokovic's chances very much. But No. 10 seed David Goffin might have something to say about it. Goffin is likely to play Thiem in the round of 16 and he has been burdensome for the Austrian in their career head to head series. Goffin has a 6-3 lead over Thiem and the enterprising Belgian has won their last two meetings at the Australian Open on hard courts and in Monte Carlo on clay this year. In 2016, Thiem narrowly defeated Goffin in four sets at Roland Garros. Goffin could well have the edge this year. Goffin won a hard fought, three set encounter over Djokovic last month in Monte Carlo. If they meet at the French Open, Djokovic will be in for another rugged skirmish from the backcourt but ultimately I would give him the slight edge in five sets. So I believe Nadal and Djokovic will square off in the penultimate round. Djokovic is ahead 26-24 in their renowned rivalry but Nadal holds a 6-1 lead over his adversary on the Roland Garros clay. Djokovic took their last showdown two years ago when he was riding high and Nadal was at a very low point psychically. What will happen if they meet again in less than two weeks? My projection is for a four set Nadal victory. Djokovic has not won a tournament since Doha at the start of the year. He did improve with each clay court tournament he played across the spring, losing a hard fought quarterfinal to Goffin in Monte Carlo, reaching the semifinals of Madrid before losing to Nadal, making it to the final of Rome. And yet, he faltered flagrantly on the Italian clay in the title round contest against Sascha Zverev after an impeccable showing against Thiem. His psyche remains wounded. More work needs to be done by the Serbian to repair it. That may take some time, even with Andre Agassi coaching him in Paris. What if Djokovic does not travel to the penultimate round? The way I see it, Nadal would defeat Goffin or anyone else who could conceivably make it there. Let's shift to the opposite half of the draw. The seedings indicate that 2016 finalist and world No. 1 Andy Murray should set up a semifinal appointment with 2015 champion Stan Wawrinka, who is seeded third. But Murray and Wawrinka will both be hard pressed in their quest to reach the latter stages of the tournament and perhaps put themselves in a position to win it. Murray is due to meet Juan Martin Del Potro in a potential third round contest. Del Potro has been battling some injuries as of late. Last September he toppled Murray in one of the best matches of 2016, overcoming the British competitor in a five set Davis Cup encounter. Murray never lost another match for the rest of 2016 but his clay court campaign in 2017 was mediocre at best. Yet I believe he will beat Del Potro. In the round of 16, Murray should meet the winner of a third round match between No. 21 seed John Isner and a somewhat resurgent Tomas Berdych, the No. 16 seed. My guess is that Berdych will stop Isner. Once upon a long ago, Berdych was a formidable rival for Murray. He built a 6-4 lead in that rivalry but Murray has beaten the big man seven times in a row since last losing to Berdych at Cincinnati in the summer of 2013. I am expecting an exceedingly close battle if they play in the round of 16 at Roland Garros, but somehow I see Berdych prevailing in five sets. He would then face No. 9 seed Sascha Zverev in the quarters—at least as I envision it. Zverev was boosted immeasurably by winning his first Masters 1000 crown in Rome. He will be given a stern first round test by the enigmatic Fernando Verdasco but I believe he will get through that match, probably in four sets. Zverev is expected to meet the dangerous Pablo Cuevas in the third round, who recently defeated him in Madrid. Next up for Zverev would be Kei Nishikori in the round of 16, or possibly the American San Querrey. But the gifted German should find himself in the quarters, with Berdych standing across the net. This could be a sparkler of a skirmish. I favor Zverev to record a four set victory, and on he would go to the semifinals. The bottom of that top half of the draw is filled with unpredictability. It is anticipated that the No. 7 seed Marin Cilic is going to play No. 3 seed Wawrinka in the quarters, with the winner in my estimation to come up against Zverev. Cilic has the task of playing 2014 semifinalist Ernests Gulbis in the first round but should navigate his way safely through that duel. In the third round, a battle looms for Cilic with 2013 Roland Garros finalist David Ferrer, who is just a shell of his former self. The ever explosive No. 12 seed Jo-Wilfried Tsonga could well take on No. 18 seed Nick Kyrgios in the third round, with the winner to play Cilic in the round of 16. I go with Tsonga to beat both Kyrgios and Cilic for a place in the quarterfinals. Wawrinka figures to have a tough third round appointment with No. 28 seed Fognini. I am picking Wawrinka in five sets. He would then go into battle against either Richard Gasquet or Gael Monfils. Wawrinka will defeat either of those Frenchman. And so, in my probable scenario, it is Wawrinka versus Tsonga in a blockbuster quarterfinal. Who is the victor? Tsonga beats the 2015 champion in five sets, reversing the result of their semifinal two years ago. That gives us Tsonga against Zverev for a place in the final against Nadal. The French crowd will cheer fervently for their man Tsonga, but Zverev will win that match in five riveting sets, earning a birth in his first final ever at a major. In Monte Carlo, Nadal annihilated the German 6-1, 6-1 in the round of 16. Zverev has come a long way on clay since then, winning not only Rome but Munich as well on the ATP World Tour. He will approach his collision with Nadal in a positive frame of mind. This 20-year-old will acquit himself well but does not have the answers to deal effectively with Nadal's clay court genius. Nadal will garner his tenth title in straight sets. He settles down convincingly after trailing 1-3 in the first set to win 7-5, 6-4, 6-3. And what of the women? I have deliberately waited until now to look at their tournament because seldom if ever has the picture surrounding the women's event looked more muddled. Serena Williams, of course, is pregnant and unable to chase a fourth singles title in Paris. Maria Sharapova did not get a wildcard into the main draw or even the qualifying. From 2012-2015 these two icons won all four titles, taking two apiece. Last year, Williams was back in the final, losing to Garbine Muguruza. How to assess the 2017 field? I would have picked 2014 finalist Simona Halep with few reservations but she heads into the tournament still healing from a torn ligament in her ankle. That is not an ideal way to approach a major. I still make her one of the favorites along with No. 5 seed Elina Svitolina, No. 2 seed Karolina Pliskova (although she is a much better player on hard courts), No. 8 seed and 2009 champion Svetlana Kuznetsova, No. 4 seed Muguruza, and last but not least No. 13 seed Kristina Mladenovic of France. I have no confidence whatsoever in top seeded Angelique Kerber at the moment. A cluster of other players including Americans Venus Williams (a finalist back in 2002), Madison Keys and CoCo Vandeweghe could make good runs but I don't believe they can win the tournament. It is time to examine the draw. Kerber could have big problems right away. Her first round meeting against Ekaterina Makarova might be treacherous. The left-hander is ranked No. 40 in the world. She was a semifinalist at the 2014 U.S. Open and again at the 2015 Australian Open. Her Roland Garros results are unexceptional but Kerber is not that comfortable against other lefties. I sense an upset there. The No. 8 seed Kuznetsova is in that same quarter of the draw. I believe she will stop Christina McHale in the first round and keep going strong into the semifinals. Muguruza has been struggling inordinately all year. She has a first round encounter against 2010 champion Francesca Schiavone, who will soon turn 37. Muguruza should prevail, but the view here is that she will lose in the round of 16 against Mladenovic. Venus Williams looks ready to make a charge into the quarterfinals but Mladenovic will halt the American in three exhilarating sets. Kuznetsova and Mladenovic collide in the semifinals. It is a colossal battle from beginning to end but the Frenchwoman is the victor in a come from behind three setter. In my scenario, Svitolina defeats Keys in the round of 16 and she takes on No. 3 seed Halep in the quarterfinals. This is a very tough call. For a variety of reasons, I give Svitolina a three set victory, with the outcome in doubt until the very end. Svitilina meets No. 7 seed Johanna Konta in the semifinals, and comes away with a clearcut victory over the British competitor. On to the final goes Svitolina for a dramatic and consequential showdown with Mladenovic. It is a pendulum swinging confrontation. Svitolina captures the first set and goes up a break in the second. Mladenovic retaliates and her excellent ball striking carries her back into and eventually through the second set. The 24-year-old Frenchwoman builds a 4-1 final set lead, loses three games in a row, but recovers her confidence to win 4-6, 6-4, 6-4. I like that scenario but I can envision several others for the women. Probably 10 to 12 women could win Roland Garros under the right circumstances. But the battle for supremacy among the men is an entirely different story. Wawrinka might come alive. He has become a surprisingly commanding big occasion player. Djokovic and Murray will be striving mightily to reignite their games. Zverev or Thiem will be seeking the validation of a first major title. But, in the end, all of the evidence strongly indicates that Rafael Nadal is poised to peak again at the major he has dominated for a decade and beyond. I can't imagine anyone denying the Spaniard a 15th Grand Slam championship as he goes to work once more on his favorite surface in front of fans who fully appreciate everything that he has done to establish himself as a Roland Garros fixture and the greatest clay court player in the history of the sport.